About 200 supporters held signs yesterday along South King Street during a mass-transit rally outside Honolulu Hale organized by the coalition Support Rail Transit. Mayor Mufi Hannemann implied yesterday that he is viewed unfairly whenever he assails critics, such as anti-rail leaders, because of his racial background as a Samoan leader. Hannemann also called Gov. Linda Lingle "wishy-washy" yesterday, arguing that her support of an anti-rail movement contradicts her previous stance on the issue. Lingle said this week that she likely will sign a petition to let voters decide whether to stop the city's $4 billion rail transit system. Lingle also criticized Hannemann yesterday for personally attacking rail opponents, saying that if he has a good argument for the project, he should calmly lay it out. Mayor Mufi Hannemann implied yesterday that he believes he is viewed unfairly whenever he assails critics, such as rail transit opponents, because of his racial background as a Samoan leader and his height of 6 feet 7 inches. "When a big Polynesian guy gets up, (people think), 'Oh, my, too strong,'" Hannemann said. "That's what's happening in people's mind. I'm passionate. I wouldn't be here today if I didn't believe a Polynesian male could be the leader of this city. ... I believe in my heart and soul that this is the right thing to do." Mayor Mufi Hannemann also called the governor "wishy-washy" yesterday, noting that Gov. Linda Lingle's backing of an anti-rail movement reverses her previous stance on the issue. "It seems to me that our good governor is a little bit confused," Hannemann said at a news conference yesterday in response to statements Lingle made Wednesday, saying she will likely sign a petition to let voters decide whether to stop the city's $4 billion rail transit system. "I think she has to hang in there. But that's the role of a political leader. You don't waffle when times get tough. You stick to your convictions." 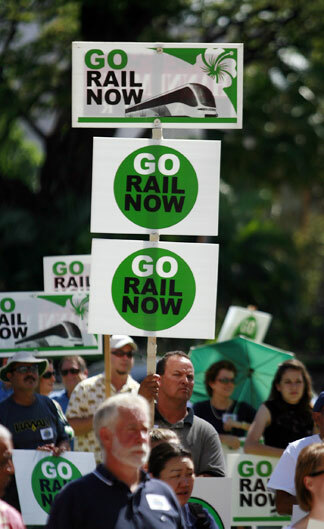 Rail supporters held signs yesterday at a rally outside City Hall. The event was organized by the coalition Support Rail Transit and was attended by an estimated 200 supporters. Also yesterday, pro-rail Mayor Mufi Hannemann called Gov. Linda Lingle "wishy-washy" for her latest comments on rail transit plans. In an informal meeting with reporters at the same time yesterday, Lingle also criticized Hannemann for personally attacking rail opponents. If Hannemann has a good argument for the 20-mile elevated system from Kapolei to Ala Moana, he should calmly lay it out and not personally attack people, Lingle advised. "I don't think attacking people in a personal way, talking about the previous governor's wife, helps the situation. And it diminishes his credibility when he does it, because people start to ask the question that if you are right on the issue, why would you have to personally attack another person -- constantly personally attacking people -- instead of laying out sound arguments?" Lingle said. On Monday, Hannemann criticized former Gov. Ben Cayetano's wife, Vicky, saying, "He has a household that doesn't like rail." Hannemann emphasized Lingle's State of the State address in 2005, when she expressed enthusiasm for mass transit and working with him. Although an early supporter of some form of mass transit, Lingle says she has not reached a decision about the plans supported by Hannemann. Funding for the system caused Oahu taxpayers to see their excise taxes rise 12.5 percent from a rate of 4 percent to 4.5 percent. Lingle says since she first looked at the transit plans, much has changed, but Hannemann is including her as a supporter of rail. "He is implying things that simply are not true. It is important to the public to be rational and calm and objective about it," Lingle said. "In many ways she was the key to this happening," Hannemann said. "We've had many opportunities to chat either in a formal or informal setting. She never brought up the wishy-washiness that she brought up now." 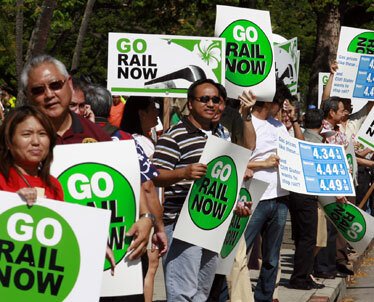 Yesterday afternoon two recently formed pro-rail groups -- Support Rail Transit, backed by union groups, and Go Rail Go, backed by a group of residents -- held a rally of about 200 supporters at Honolulu Hale, where Hannemann gave a campaignlike speech. On Monday, Hannemann also attacked Cayetano because he supported his opponent, former Councilman Duke Bainum, in the 2004 race for mayor. In an e-mail to the Star-Bulletin, Cayetano called Hannemann's arguments "an angry, incoherent personal attack against me."